Reach 10000 points within 90 seconds to complete the level. This level have new type of requirement with little complicated board and have 8 grill boxes, five chocolates and four meringue blocks that blocks candy to be at the bottom of the board. To complete this level first try to break chocolates and other blockers and as candies start to fill at the bottom you will have more candies to play and can easily reach the requirement. You should also try to make special candies even if you get chance to make striped candy and try to break bonus candies as fast as possible. 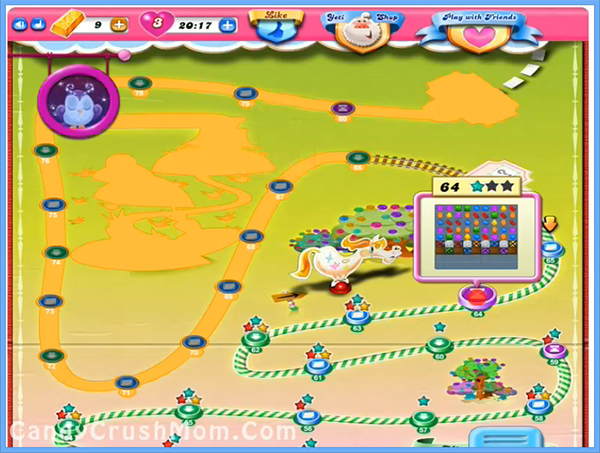 We completed this level with 60760 score and got few special candies that help to get three star score.